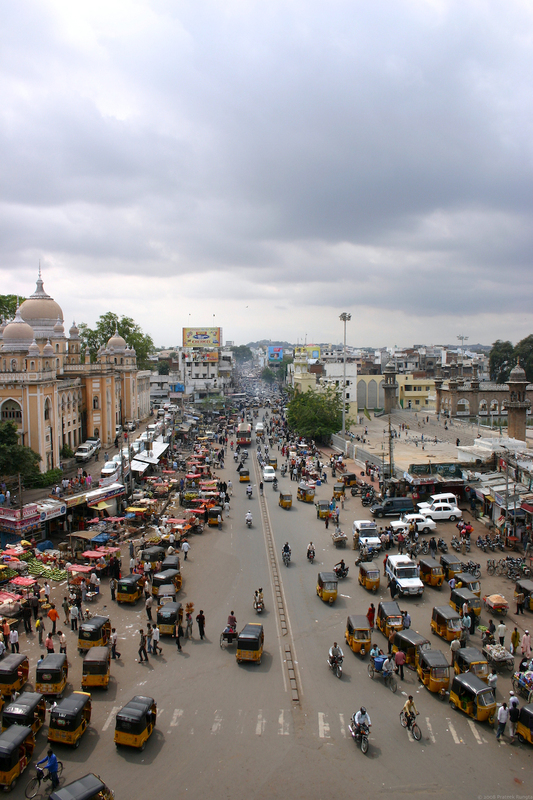 Hyderabad for you – the south view from the Charminar. View the smaller version on flickr. Thanks Anil. I was in Hyderabad for two days, and I had a great time there. hey..nice pictures..doesn’t look like Hyd at all..when were u here? I was in Hyderabad on the 12th and 13th earlier this month. Pretty cool. Really nice capture of the vivid colours of objects. I bet you’ve used DoubleTake with many more photographs. No Abhishek, this is the first one. I’d used other tools before but they either left me with a bitter taste or got me frustrated enough to abandon the effort, as a result of which I’d given up on taking panorama shots. Lucky for me I decided to give it another try and found DoubleTake fit my bill perfectly. Btw, I nice work with the panorama too. Though I tried quite a bit to find where they were stitched, I couldn’t thanks to the mouse-scroll. Did you think about making it from bottom to top in a vertical photo so that it looks like one is driving up the road? This is quite in stark contrast with the pristine photos that you take of Melbourne or the city of Dubai where I live. Yet it is this hustle and bustle of Bombay and Delhi that one misses. Couldn’t agree more. I just got back to Melbourne last night and everything feels so…quiet here. Did you think about making it from bottom to top in a vertical photo so that it looks like one is driving up the road? No I didn’t, but its a great suggestion. Will try it sometime in the future.